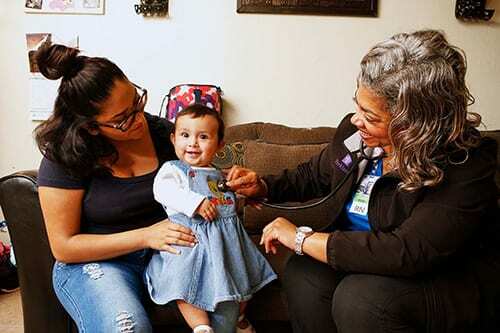 Home Visiting Uptake Among Medicaid-Eligible Mothers. The Department of Health and Human Services (HHS) supports a wide range of evidence-based early childhood home visiting programs which aim to improve the health of at-risk children. The standard nurse home visiting model provides access to free, in-home pre- and post-natal care from a nurse to low-income, first-time mothers. However, take up is often below optimal levels and attrition is high across programs. To increase take up, a new evidence-based postcard was sent to eligible expectant mothers in Colorado. The postcard highlighted the benefits of the program, shared personal experiences from clients, and highlighted Invest in Kids (IIK) contact information for a dedicated staff member. The postcard was created in both English and Spanish and alerted potentially eligible mothers that they would receive a phone call from a nurse to set up an appointment. The postcard sought to create an additional communication channel to relay information on the program benefits, increase mothers proactively reaching out to IIK, and accepting calls from IIK nurses to discuss the introduce the home visiting program. The evidence-based postcard was tested with an individual level randomized control trial. 6,846 IIK referrals were randomly assigned to receive the business as usual outreach or the behaviorally-informed postcard prior to the standard IIK phone call. The test was fielded between July 2016 to March 2017. The postcard intervention did not lead to a significant increase in the take-up rate of IIK services in Colorado during the study period. The control group (N= 4,165) had a take-up rate of 5.3 percent (95% CI [4.77% to 5.83%]) versus the treatment (N= 2,681) rate of 6.5 percent (95% CI [5.92% to 7.08%]). These differences were not statistically significant. This partnership underlines the challenge of obtaining and maintaining reliable contact information for priority populations and the importance of improving the accuracy of contact information for individuals that are potentially eligible for home visiting services. The low take up rates documented in this partnership, of less than 10%, further underline the challenge of low take up and low completion rates for home visiting programs. More intensive interventions may be necessary to substantially increase access to these important programs.